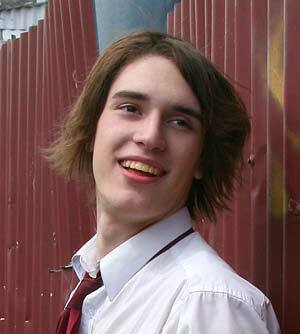 Jamie Williamson is an amateur actor and filmmaker who was cast in the role of Jamie after a single screen test. Having made his own short films with friends, Jamie is well versed in the art of low/no budget videos, and was keen to take part. While still at school, Williamson has been an integral part of this project, making the character his own and making the most of what is, essentially, limited time on screen. His performance was over and above what director Rodney Twelftree was expecting, and was a catalyst in the on set chemistry between both himself and fellow castmate Stephen Holmes. One of his major reasons for taking the role is the fact that he would get to play with fake blood, something his own short films never quite got to do. Williamson is currently completing his schooling, and works part time to supplement his income. Schoolyard Justice marks his first foray into acting outside his own projects, and he hopes to continue with video production after SYJ is complete. "That was sweeter than the last lot" referring to the batch of fake blood that was squirted over himself and Stephen.